I've spent 10 hours in the car with 2-3 littles six and under (Micah and Abby car-hopped between riding with me or with Gigi and Pops) over the past two days. I'm happy to say I haven't gone insane yet but we've got another 2 (or so) hours tomorrow, 6 the next day and 4 the day after that. 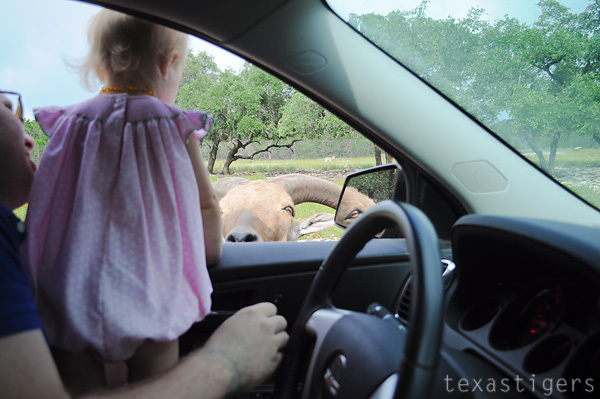 (Those times are including stops at Bucees, and for lunch or potty breaks.) We had minimal tears shed in the car as well which I'd say is pretty impressive with a busy 17 month old. Of course I shouldn't be saying this right now as we still have to head back home and I'm sure this could likely jinx it. 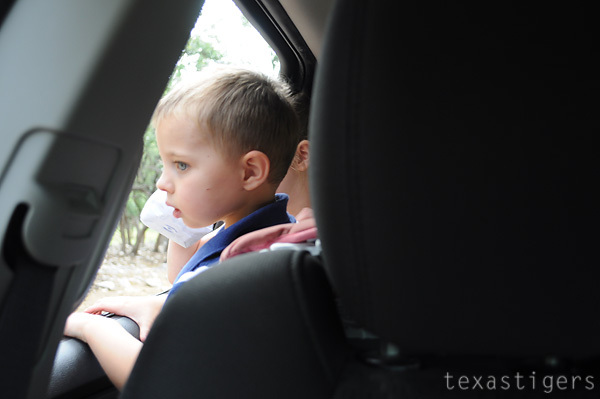 So today I'm sharing a few of my 'tips' for staying sane on the road with littles. We sing lots of kid friendly music. I have several CDs of the music the kids sing during praise and worship at Church and we sing those songs (along with some of the motions that we can do in the car.) Then we add in Old McDonald (or Old Man Noah to change it up and add extra animals), If you're Happy and you know it, and all those classic songs. Micah and Lexie were getting a kick out of singing today. Leappad. Perfect for when you can't play another game or sing another song and need some quiet. We don't have a DVD player in the car nor could both kids watch at the same time based on where their carseats are arranged so having leappads with learning games is a good way to have some quiet play. 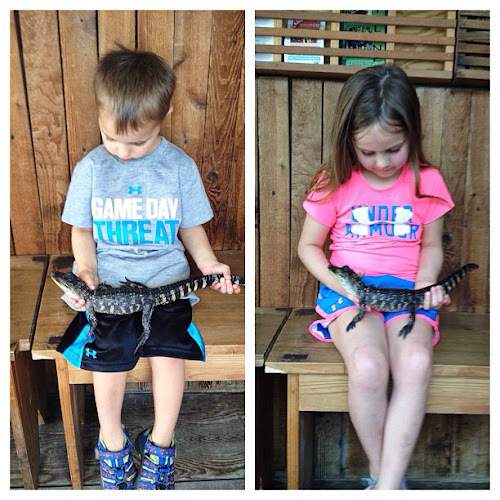 If you see a billboard that says "hold baby alligators," pull off and stop. 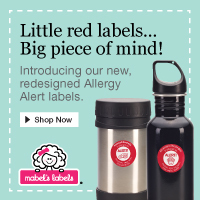 You'll have some very happy littles. It was only a 15 minute break but it gave everyone a break from the car and something fun to do. You'll notice I didn't mention coloring books, notebooks, crayons.... I found these drop way too easily and then we have cries because they can't reach it and we either have to deal with the cries or pull over neither option is a 'win.' Books are good but Micah gets bored too fast not being able to read to himself and since they don't sit next to each other when he wants Abby to read to him it ends with upset littles because we can't see the pictures. And not part but the five but snacks are always a must, preferably ones that don't crumble easily and are easy to hand out a few at a time (like goldfish or animal crackers) to minimize the crumbs and mess when you get home from your trip. 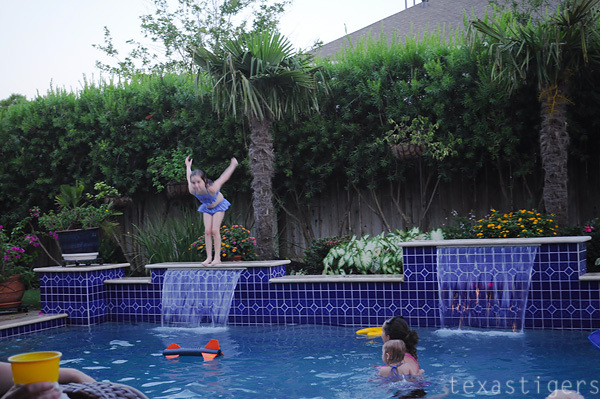 Swimming and summer time go hand in hand for us. 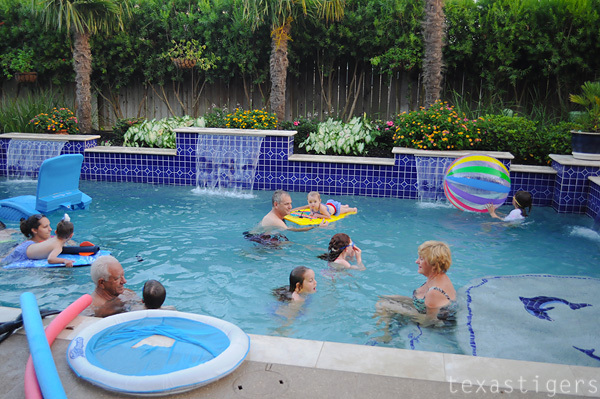 It's hot and the pool is the perfect way to cool off. These cousins sure thought so! They couldn't wait to get in and swim. 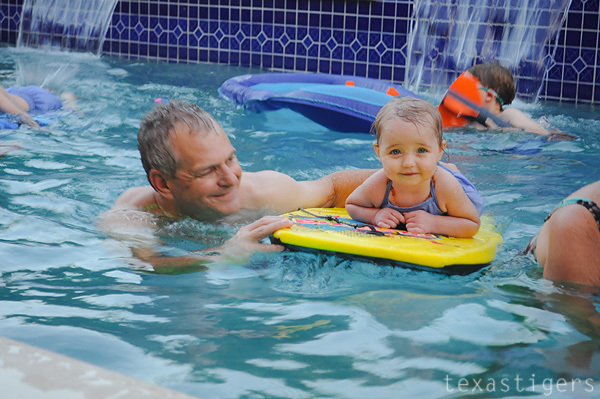 They especially loved all the variety of toys in the pool to play with especially the little two. Now the littlest two and I are headed to pick up Abby this afternoon. It ought to be a quiet car ride since everyone is worn out from VBS! Happy Wednesday everyone! It's VBS week over here so while Abby is off at Camp Gigi, Micah is having fun at VBS and Lexie and I are helping taking care of the babies of the VBS teachers. It's a busy, exhausting week (more for them and the VBS teachers than us but it's still tiring!) Here's a little update on what we've been up to on instagram. So you maybe have seen all these already if you are following me over there but if not here ya go. Alexis is not big on carbs and would rather snack all day long than eat a lot at a time.... unless it's mashed potatoes (and occasionally black beans.) My mom saw this picture and asked why I didn't give her a spoon so for the record, she does have a spoon - it's in the hand that got cropped out when I posted it to insta-gram. 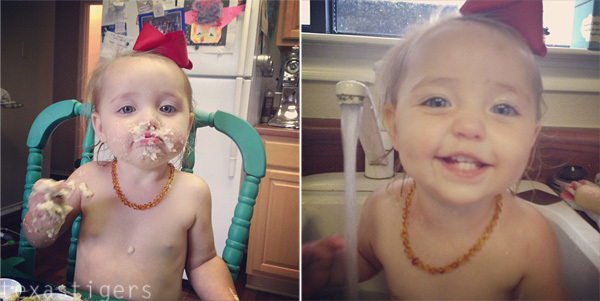 When you cover yourself in mashed potatoes, you get a sink bath after dinner. This was bath number 2 of the day since we had a post-swim bath before dinner! The weekend before last we spend the day at Sea World while I attended the AdventureCon blog conference they put on. My mom wrangled the littles while I was in sessions but we had plenty of time to play between sessions. 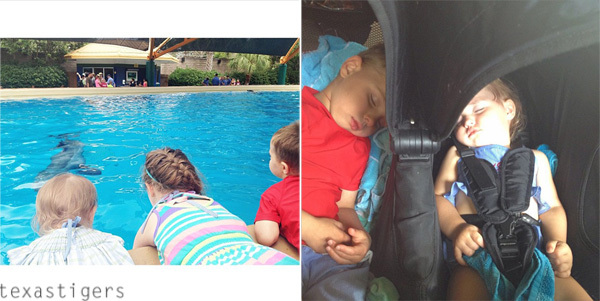 The little two played so hard that after swimming at Aquatica that they fell asleep while we were waiting in line for lunch. That worked out because they had snacked so they weren't too hungry and they got a nice nap in to be able to stay and play all day. 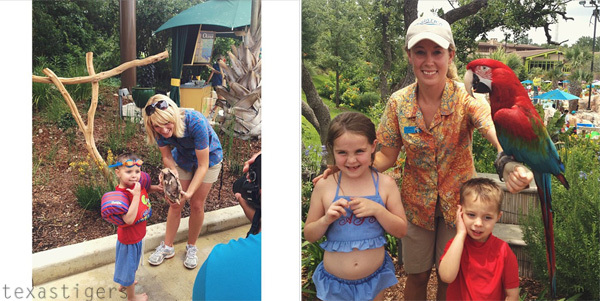 While in Aquatica both kids got to meet and greet with a few animals - first an armadillo then Toby the macaw. Toby was an excellent dancer! This candy bar was delish! I need to see if HEB carries it or if I need another trip to REI to get another one. 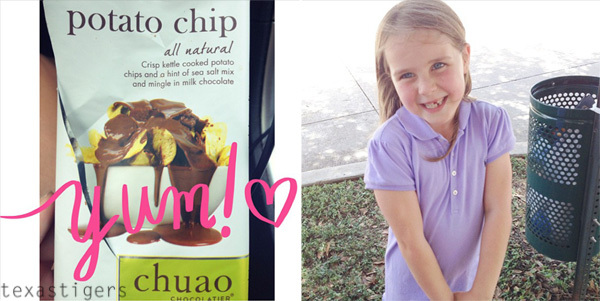 Seriously a chocolate bar with potato chips inside - sweet and salty all at the same time. This girl was whisy-washy on if she wanted to stay at Gigi's house for a week but decided to stay. She had a rough first night but seems to be having a fun time. It's been awfully quiet around here without her. 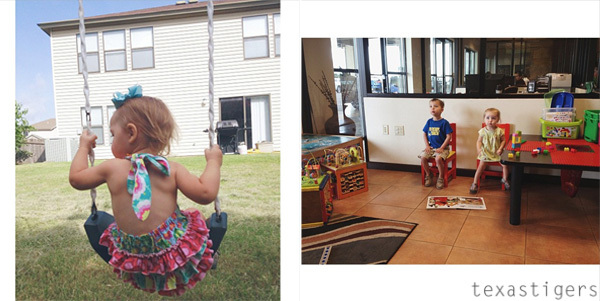 On Monday, Alexis took a 3 hour + nap and Micah played quietly and watch a little ipad. 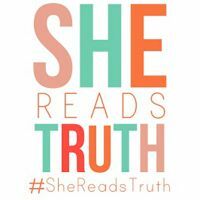 I was able to knock out some serious picture editing and blog post rough drafts! I couldn't resist snapping a picture of Micah before rescuing him. I was sitting on the couch with him and he sat up on the top/back of the sofa. Then I heard a 'mama help me please!' 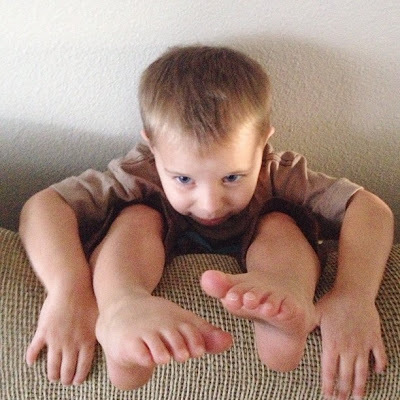 Whoops his tiny self slid down between the wall and the sofa. Saturday morning I babysat a friend's little boy so before it got too hot outside we all headed out to swing. Since I had the little guy in Alexis's swing, she proved she was able to swing like a big girl. Sad that my tiny babe is growing up. 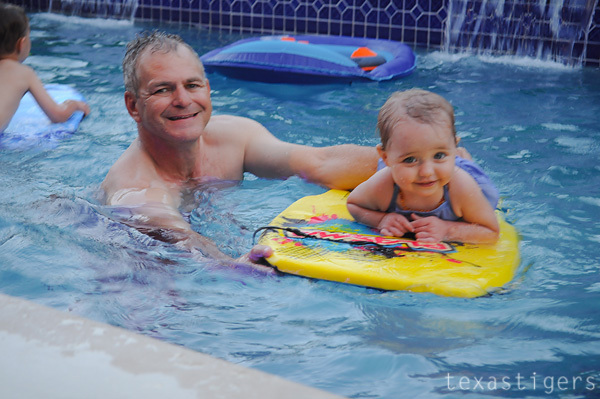 Last week we visited Houston to visit with my parents and some cousins and second cousins that were in town. 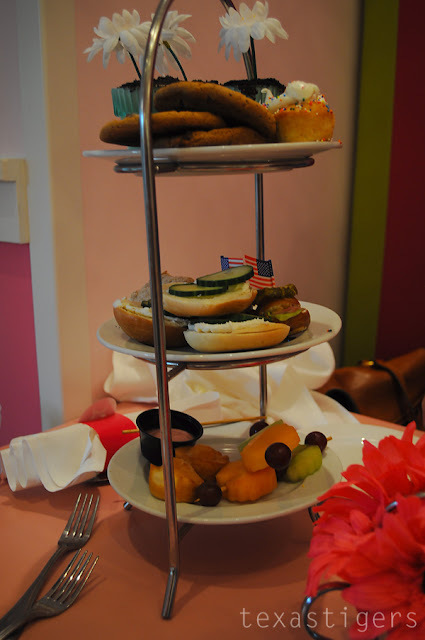 One of the things high on my list of things I wanted to do over the summer was to go to tea at American Girl with my two girlies and my mom. 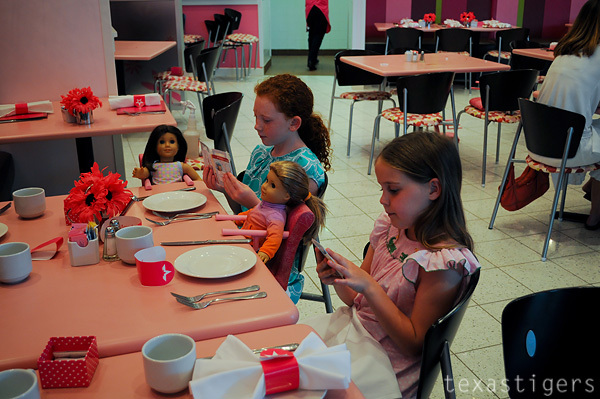 My cousin and her daughter also wanted to visit the American Girl store while they were in town so we all had tea together. 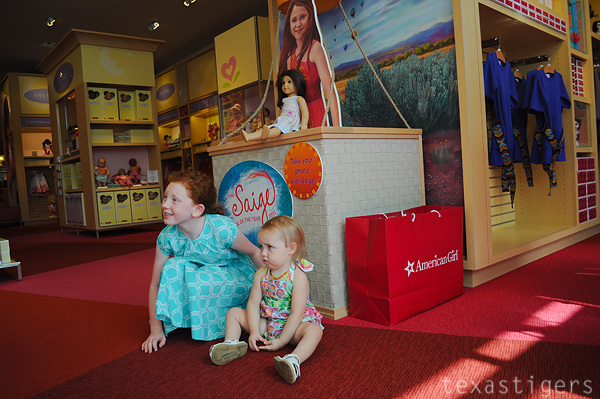 It was fun seeing the girls play with their dolls together a little as they got reacquainted. 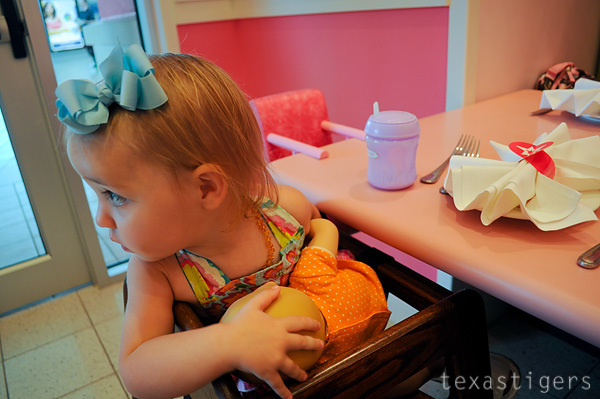 Lexie wasn't so sure about the doll high chair for her baby and instead wanted baby to sit with her. However she kept trying to figure out how baby and baby's high chair could sit in her high chair with her. It just wouldn't all fit. Then, of course, she was too busy to sit still for long and was out of her chair and into my lap before our food arrived. The girls had fun with a little book of activities while we were waiting. There was a sticker page, paper dolls and other activities in the little packet. 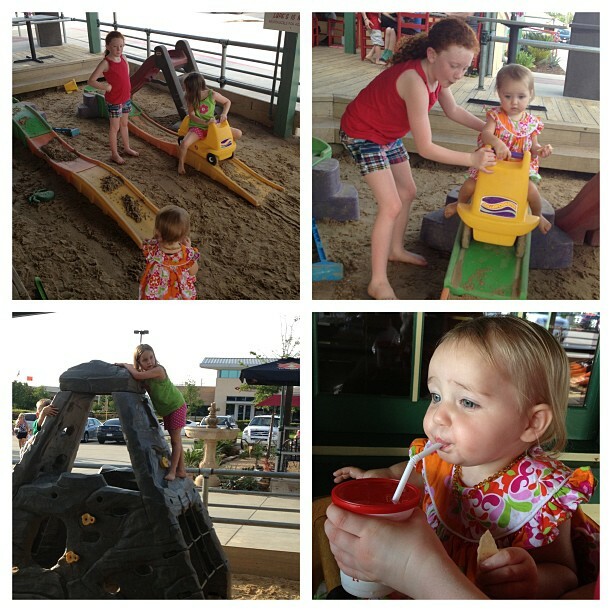 Then girls enjoyed sharing their tea (or in this case rootbeer and strawberry lemonade - it was hot outside!) with their dolls in the dolls tiny cups. 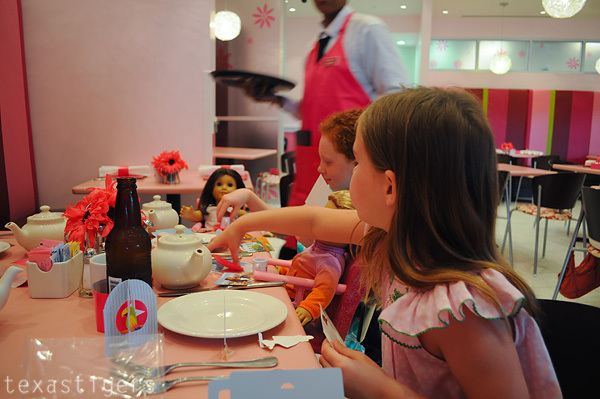 Drinking it so that they could pretend their dolls were drinking. Our yummy spread - fruit with dip, three types of sandwiches, cookies, cupcakes and chocolate mousse. Then a photo with Saige in the hot air balloon. 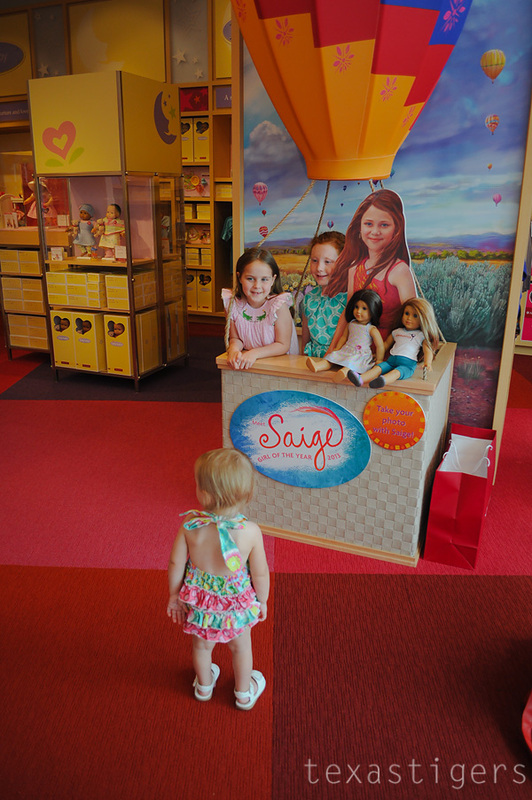 Lexie wasn't so sure. 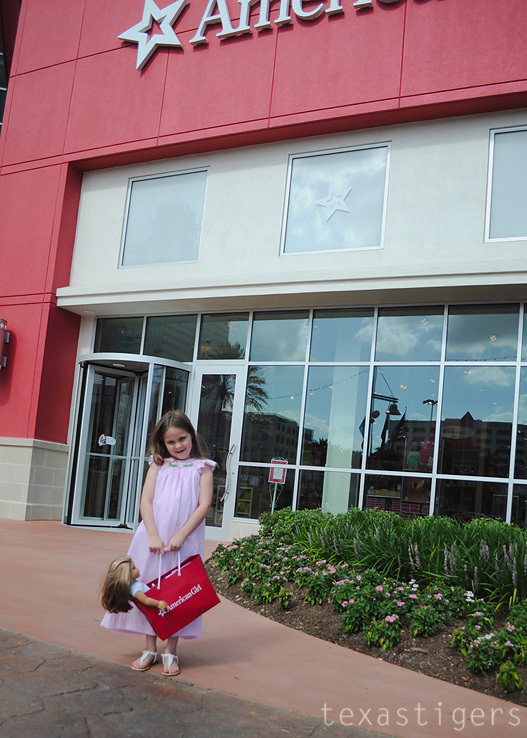 Abby choose to get McKenna's ears pierced and a book to read. She was a happy girl! We are crossing off things right and left on our summer bucket list and it's only just now the first 'official' week of summer! Abby's only been out of school for a little over two weeks! One of the things on our list was to (finally!) 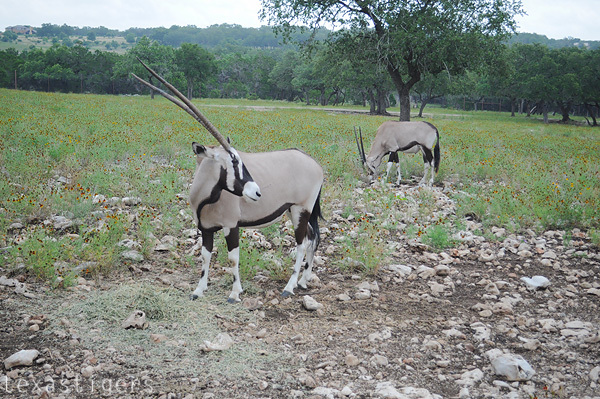 visit the Natural Bridge Wildlife Ranch. 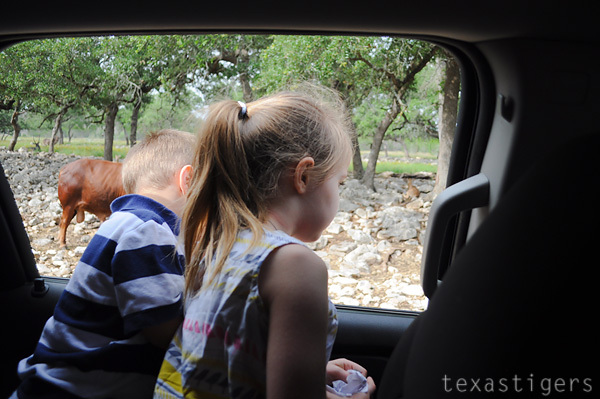 After living here in San Antonio for almost 6 years, it was about time we headed up there! 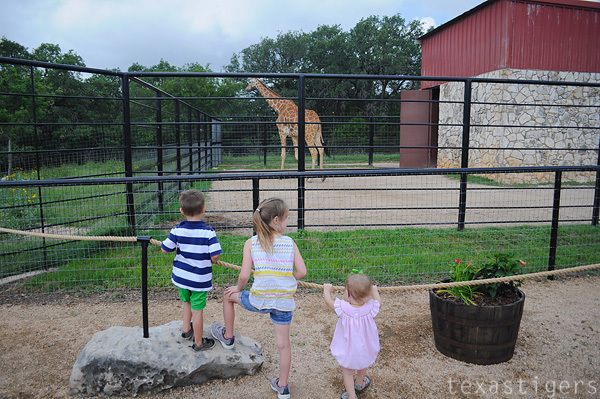 The littles are always asking why the zoo doesn't have a giraffe any more so I knew they'd love seeing the giraffes and especially the new twin baby giraffes. I'll warn you know this post is extremely picture heavy but it was so hard to narrow down the pictures I wanted to share! 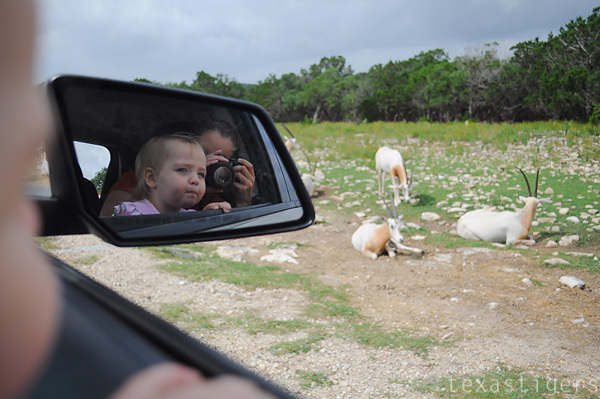 We headed in and once on the path through the Wildlife ranch we were almost immediately surrounded by animals. 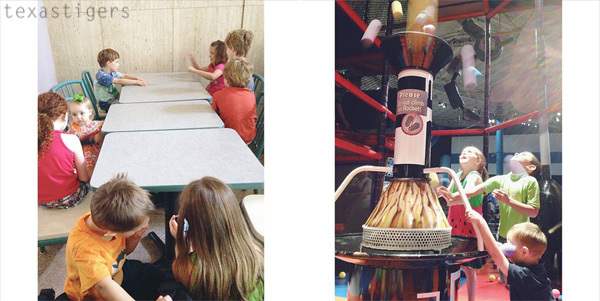 The kids were in awe! 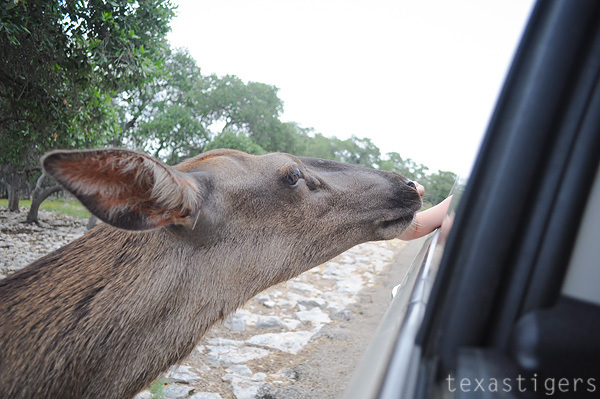 The first animals we saw were mostly deer along with a few longhorns. 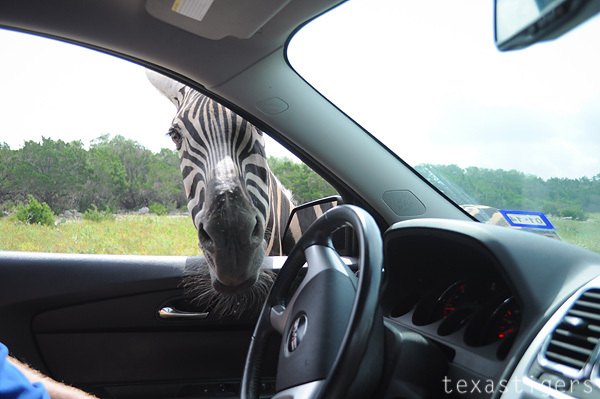 As we drove further into the park we started seeing more various more exotic animals. 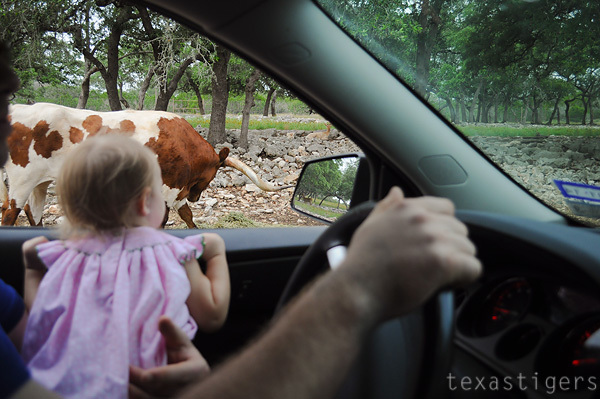 Even some babies who were still learning where the food came from because they tended to linger longer in front of the car and we had to wait for them to move out of the way before we could continue. 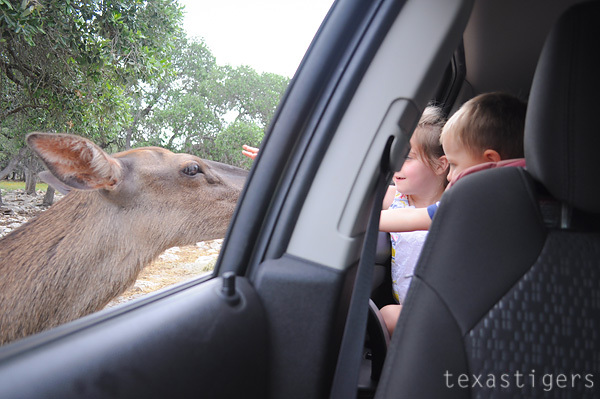 Some animals were braver than others and started coming right up to the drive side window to get food. This one headed for the kids window and they loved that! 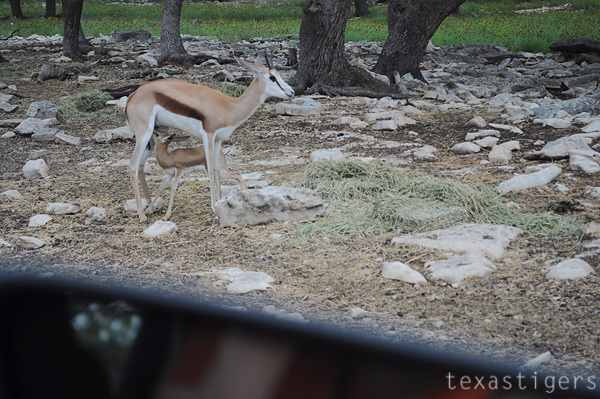 We came across this mama and impatient baby along the drive. 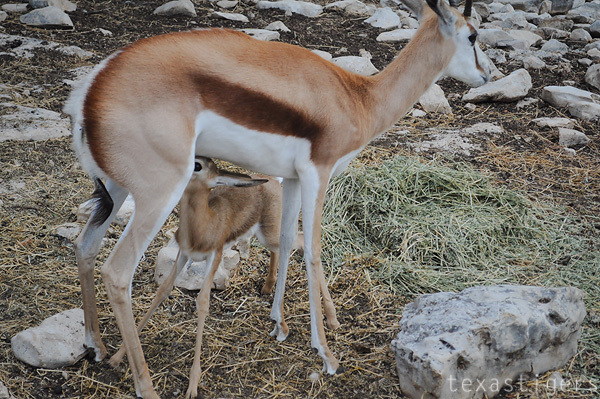 Babe kept head butting mama to get the milk flowing faster! 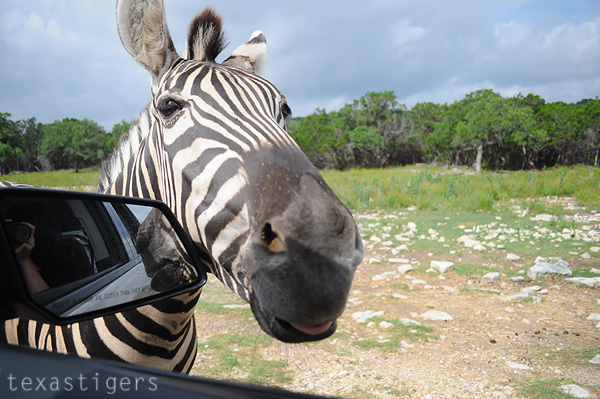 Then we came to what Beau had been looking forward to the most - the zebras. They weren't shy at all either, coming right up for food. This guy (girl?) had an itch and used the window to scratch the side of his head. 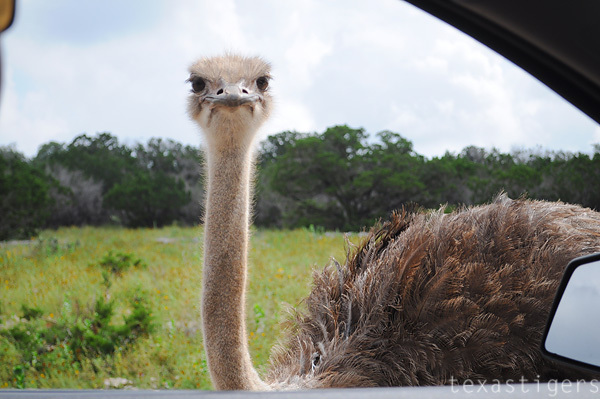 The emus weren't shy either. 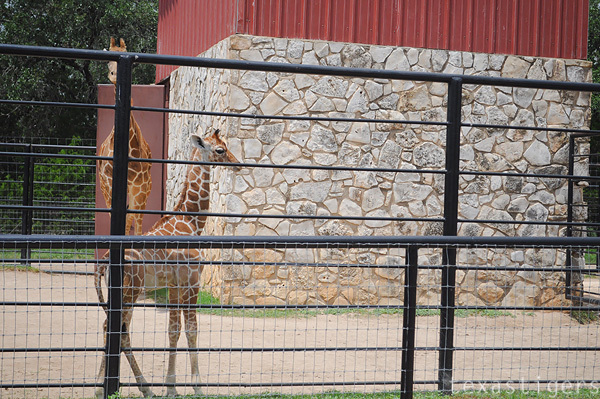 This guy stuck his head all the way in to try and stick his head into the bag of feed. 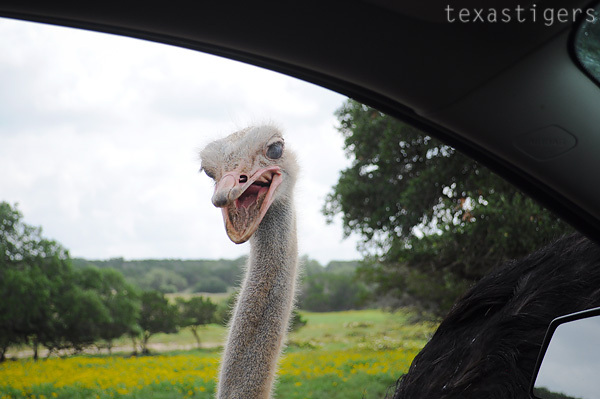 The ostrich and emus were a little scary! Especially when they are sticking their beaks in to try and get the food instead of nicely eating it off the ground. 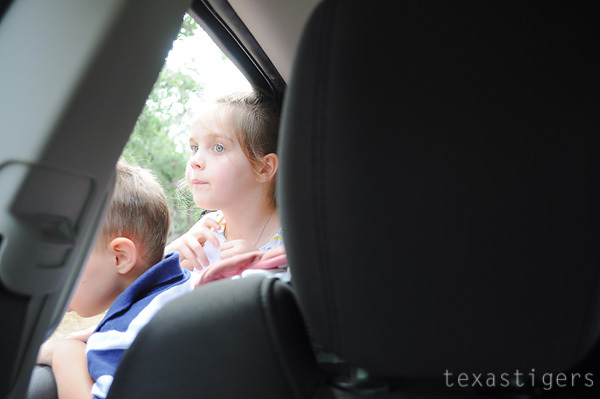 The littles asked to have their windows rolled up when we were near them. 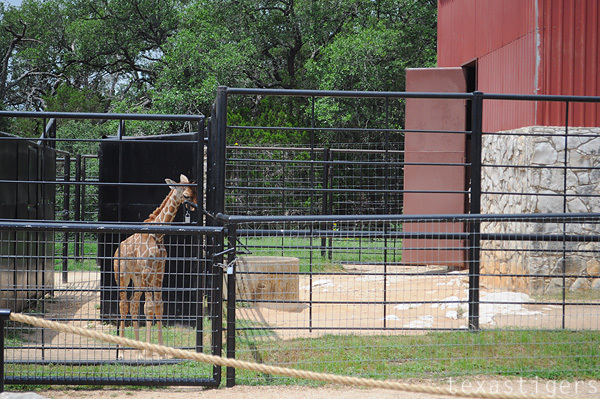 Then we took a stop in the petting zoo. Alexis wasn't sure what to make of this, and truth be told it probably wasn't my brightest idea! 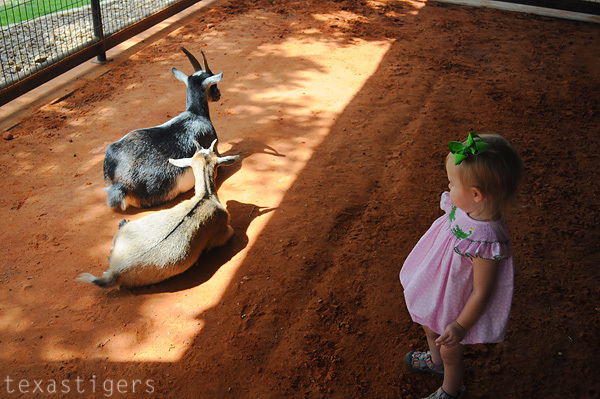 Abby and Micah loved it, especially seeing the baby goat. However it wasn't the nicest smelling of places. 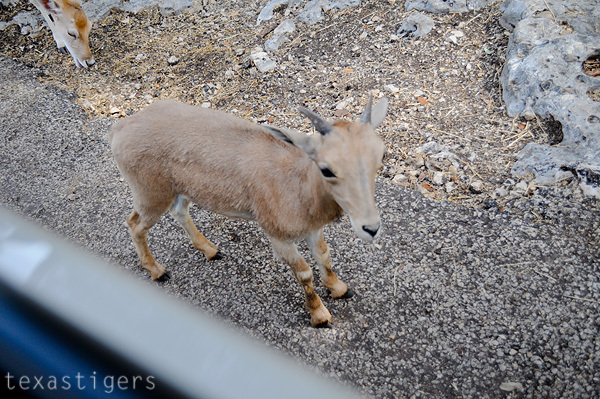 Also goats like to nibble.... especially this guy. 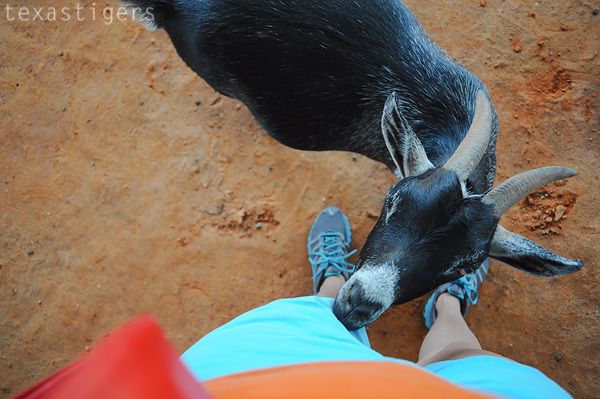 He tried to nibble on my shorts as well as on Alexis's bubble. 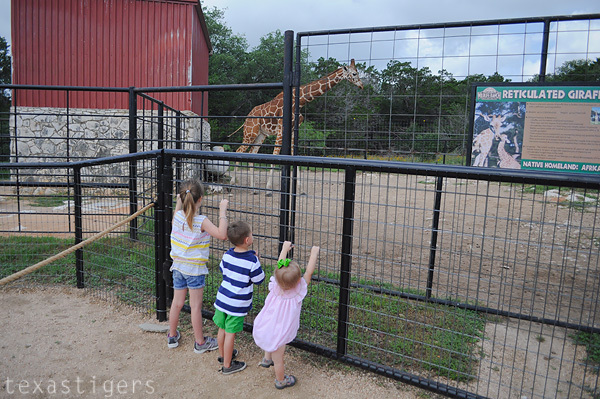 We made our way over to the giraffes and were able to watch them for a little while. 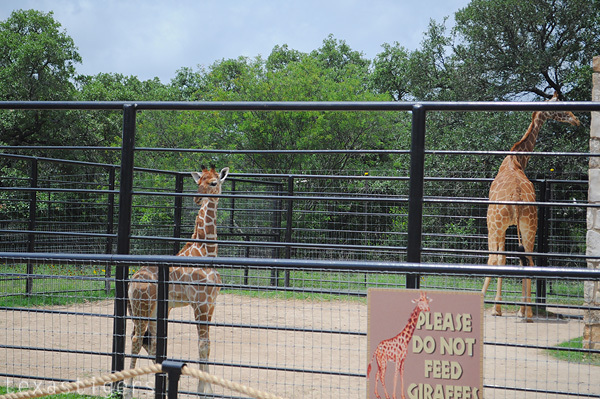 This is the male baby, named Nakato, who is in a separate pen from his mom and being bottle fed because mama has shown some aggregation towards him stealing milk from his sister. Then this is the first born female baby, named Wasswa. 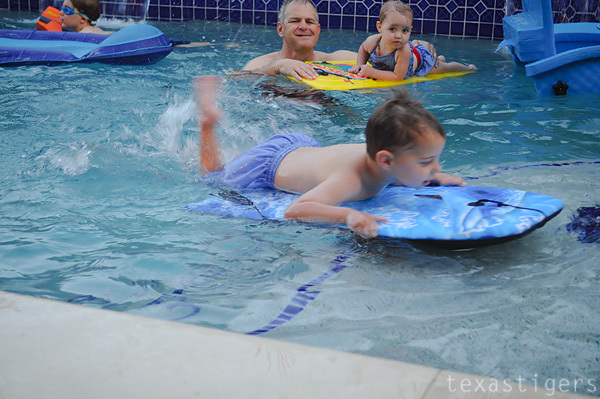 Have you checked anything fun off your summer list yet? 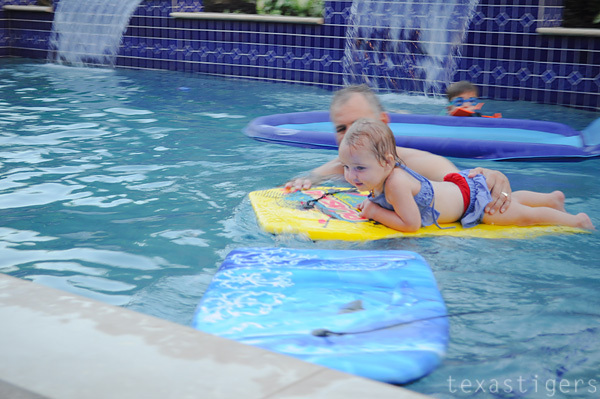 Don't forget about the giveaway for admission for 2 to Schlitterbahn!